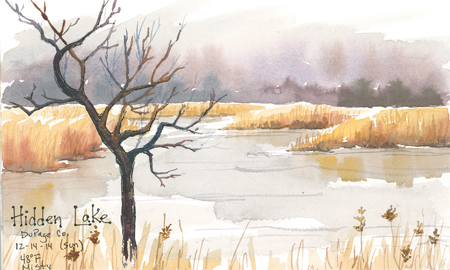 Hidden Lake and a Strange Tree Sketch – Let's Paint Nature! quakes tenderly in the silence. A strange tree stands alone. His poetry comes to life. I bargain, but it’s no use. Last weekend I had the chance to make a quick getaway to Hidden Lake. The scene was so beautiful, so delicate, so spellbinding, that when I was done painting I had to write this short piece. Not really a poem, nothing rhymes, but a deeper level of feeling a moment, translated into words on paper. A prayer. This quick time-out was just what I needed to connect and recharge my batteries for the coming week. As I grow older, I find I need this more and more. And I find myself slipping further from the expectations that corporate society has on me to run the rat race and be stuck on that treadmill that leads to nowhere. Contentment without things. Oooo the secret the credit industry doesn’t want you to know. My prayer is that you too can find an oasis, even for just 10 minutes, so that you can connect and recharge as well and get back to what’s really important. ← Let’s Paint Pines by a Lake! Beautiful artwork and poetry. Beautiful places make us want to create. They do, it’s true! Thank you fellow artist friend. You are a creative spirit after my own heart. As i read you, it was a though I were reading my own thoughts, my own sentiments. Thank you for posting this most intimate part of your soul. Deeply thankful for you comment…and honored…your work is beautiful! That lake is hidden no longer, since you showed it to my Soul. I surely hope you’re collecting your beautiful poetry and will, someday, publish it in book form. It’s sensitively, emotionally powerful. Thank you Karen, with heartfelt thanks. Your words mean a lot to me! I’m sorry, I could not find an attached poem. I would love to read it!!! Can you send it to my email?? With permission I can copy it and paste it in the comment here. The “wisdom” of that tiny town. Hushed into lullabies of peace.